Metamorphic textures are either granular or foliated. Here we examine only the foliated types. Most Metamorphic rocks form in the influence of a directed stress field. Because of this they develop conspicuous directional textures. For example, the top illustration to the right shows the stress field before application (arrows), with the mineral grains randomly oriented. As metamorphism proceeds, the sheet structure silicates (flat minerals with basal cleavage) such as mica (biotite and muscovite) and chlorite start to grow. The sheets orient themselves perpendicular to the direction of maximum stress. The new parallel mineral flakes produce a planar texture called foliation. (from the Latin folium - leaf). Foliation can be subtle or pronounced depending on the degree of metamorphism. The foliated textures develop in the sequence listed below as temperature and pressure increases. Here we just define the textures. Below are descriptions and illustrations of how each texture develops. Slaty cleavage - a pervasive, parallel foliation (layering) of fine-grained platy minerals (chlorite) in a direction perpendicular to the direction of maximum stress. Produces the rocks slate and phyllite. Schistosity - the layering in a coarse grained, crystalline rock due to the parallel arrangement of platy mineral grains such as muscovite and biotite. Other minerals present are typically quartz and feldspar, plus a variety of other minerals such as garnet, staurolite, kyanite, sillimanite. Mineral Banding (Gneiss) - The layering in a rock in which bands or lenses of granular minerals (quartz and feldspar) alternate with bands or lenses in which platy (mica) or elongate (amphibole) minerals predominate. A pervasive, parallel foliation (layering) of fine-grained platy minerals (chlorite) in a direction perpendicular to the direction of maximum stress. Found in the rocks slate and phyllite. During the earliest stages of low grade metamorphism, most pressure is from the weight of overlying rock. Therefore the new sheet structure minerals, such as clay, tend to parallel the bedding planes of the sedimentary rock being metamorphosed. With folding the sedimentary clay layering folds with the rock so that the layering still runs parallel with the bedding planes. At this point the rock is still sedimentary. With deeper burial or under the influence of compression, metamorphism begins. The sedimentary clay minerals are converted into the mineral chlorite, that has flat basal cleavage like a mica. But the chlorite is growing in a stress field that is not always running parallel to the bedding. In the drawing to the right we can clearly see the bedding, but the parallel lines running vertically is the slaty cleavage. In the link to slaty cleavage we can see how the cleavage does not run parallel to the bedding. 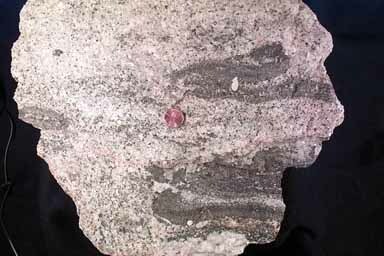 Low grade metamorphic rocks are so fine-grained that the new mineral grains are not visible with the unaided eye. Under a polarizing light microscope, the foliation can be seen. However, the slaty cleavage produces a very distinct layering in the rock that often runs at an angle to the bedding. Practically we see this in the rock slate, often used as roof shingles or as paving stones. The slate easily splits into thin sheets with smooth, flat surfaces. The layering in a coarse grained, crystalline rock due to the parallel arrangement of platy mineral grains such as muscovite and biotite. Other minerals present are typically quartz and feldspar, plus a variety of other minerals such as garnet, staurolite, kyanite, sillimanite. At intermediate and high grades of metamorphism the chlorite breaks down and recrystallizes to form quartz, feldspar, and mica. The grain size also increases and individual mineral grains can be seen with the unaided eye. Foliation in coarse grained metamorphic rocks is called SCHISTOSITY. In a hand sample the foliation can be easily seen, and ususally runs planar through the rock; that is, it all runs the same direction. In larger specimens, however, the foliation may be folded. Schistosity is derived from the Latin schistos meaning cleaves easily. Schistosity differs from slaty cleavage in both grain size and mineral content. The layering in a rock in which bands or lenses of granular minerals (quartz and feldspar) alternate with bands or lenses in which platy (mica) or elongate (amphibole) minerals predominate. The most intense form of foliation is mineral banding. At the highest grades of metamorphism, minerals begin to segregate into separate bands. The micaceous minerals separate from the quartz and feldspars. A rock in which metamorphic textures (schistosity or mineral banding) are intermixed with igneous textures (coarse grained igneous rocks). At this stage we are leaving the realm of metamorphism and entering the realm of igneous rocks. Only the rock has not yet completely melted - it has fractionally melted. Click image for more explanation.